I must admit that each salutation raised my spirit even though I had never heard of this mystery woman, but fell in love with her country/folk tales of hard roads and tough love once I scrounged up a copy of this album. Admittedly, her later albums are better statements of purpose, especially Car Wheels on a Gravel Road, but Happy Woman Blues opened my punk and wussy pop eyes to the possibilities country. Many whiskeys and George Jones albums later, I feel like I need some eagle scout medals on this fashionable lapel. However, she was one of my first exposures to the genre even if it wasn’t necessarily the most pure entryway. 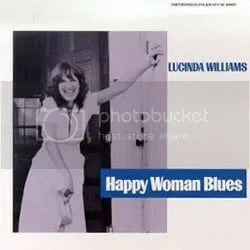 Happy Woman Blues was released in 1980 on Smithsonian Folkways and it captures Williams at her most simple and homespun. Somehow, I like her better this way instead of the overproduced and overthought efforts of recent efforts. Her voice lacks the pathos of a Dolly Parton or Tammy Wynette, but her lyrics and lazy drawl deliver the emotional breakdowns we secretly desire. Tales of one stands and drunken cries at unresponsive moons populate her songs and her quirky approach to country place her firmly inside the country canon while her legs drunkenly dangle off the sides of the wagon.